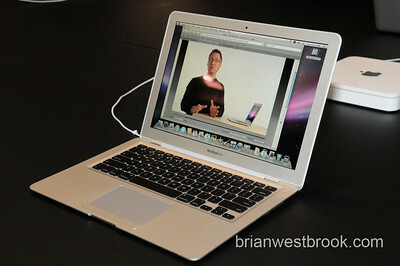 I'm Live from Macworld at the Moscone Center in San Francisco -- here's a look at the MacBook Air. I've got one on order and will bring you more once it ships (2-3 weeks). Steve Jobs used his Macworld keynote to unveil the newest member of the Macbook family. The $1799 Macbook Air is 0.79” at the thickest part, comes with an 80GB hard drive standard and has an optional solid state drive (64GB). The new subnotebook doesn’t have a built-in optical drive, but does include software to allow users to borrow a Mac or PC optical drive, and a $99 optional external SuperDrive. Pre-orders are being taken now and the MacBook Air will ship in two weeks. View my photos from the showroom floor here.